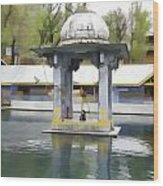 There are no comments for Premises Of The Hindu Temple At Mattan With A Water Pond. Click here to post the first comment. 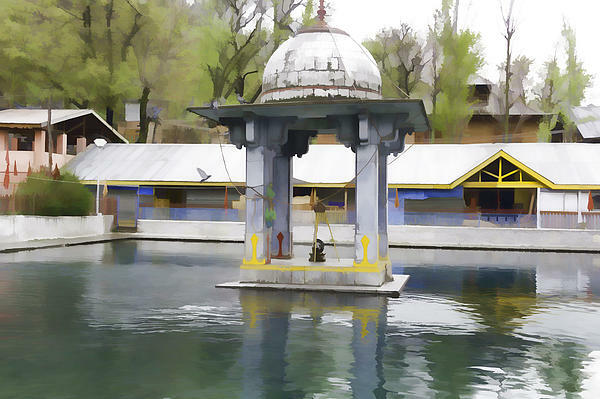 Inside the premises of the Hindu temple called Mattan (or the place is called Mattan), on the way to the town of Pahalgam from Srinagar. The premises of the temple contains some water ponds, with a small shrine at the center of one of the water ponds. The temple is for worshipping the sun god and also has a beautiful Shiv Lingam as well, and has a tank inside it with a number of fish, and devotees like to feed these fish. 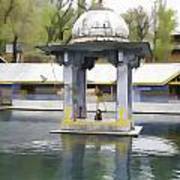 It was an important location for Kashmiri Pundits till the emergence of terrorism in the area caused many disturbances. The temple had to be guarded by a contingent of security forces, and this presence of security forces can be seen by visitors with security posts and a sand-bag position inside the temple compound. The temple was also famous to visitors because the pundits here would claim to know your entire family history based on previous visits.